The APC-45 Electric Paper Cutter from Standard provides advanced programming and cutting capabilities that is ideal for a broad range of copy and printing environments. Precise cuts are easily and safely performed with dual push-button cut activation controls. Increased productivity and convenience is realized with an automatic paper clamp, powered back-gauge and versatile program capability. Exceptionally simple to operate, the APC-45 delivers state-of-the-art features in a compact footprint. The APC-45 Electric Paper Cutter is a highly productive cutter with a unique combination of features, including powerful programming capabilities, automatic clamping, a powered back-gauge and high quality design and construction. A compact and efficient design adds to the APC-45's flexibility to fit in locations where other cutters may not, while also maximizing cutting capacity to a full 17.7" width and depth, and 2.3" in cutting height. Further versatility is demonstrated by its ability to perform bleed trims on stock sizes up to 12" x 18". The APC-45 will meet the demands of the modern print environment with its ease of operation, accuracy and long-term reliability. Simplicity: Push-button operation makes the APC-45 cutter far simpler and easier to operate than paper cutters that use manual clamping and lever action. The dual push-button controls require simultaneous two-hand operation to automatically clamp and cut the paper. An automatic paper clamp firmly applies equal pressure across the entire width of the cutting surface, securing the stock for accurate cutting. Digital Control Panel: An intuitive digital control panel and LCD readout allows the operator to input a precise cut dimension, accurate to 0.005" quickly and accurately. Advanced Programming Features: The APC-45 Cutter allows for storing and recalling up to 30 programs of 99 steps each. Three memory recall buttons can each be programmed to instantly recall key cut programs. Other features included in this advanced and intuitive electronic programming are automatic push-out, repeat cut, calculate and set functions. Safety Features: Simultaneous two-hand operation is required for cutting. Releasing either of the cut button controls immediately retracts the clamp and blade and returns them to their starting position. Each APC-45 also comes equipped with a safety beam detector across the throat opening to immediately stop the cutting action if the safety beam is broken. For added security, there is a removable on/off security key to lock the cutter and prevent unauthorized use. Control Panel: The APC-45's eye level mounted control panel has an adjustable viewing angle and is ideally located for optimal viewing and programming ease. Simple and Safe Operation: Safety beam protection, a plexi-glass safety cover over the rear bed and required two-hand cut cycle activation for safe operation. Maximum Cutting Length from Backguage: 17.7"
Minimum Cut Length from Backguage: 1.57"
Table Depth In Front Of Knife: 12"
Weight/Shipping Wgt: 662 lbs. / 685 lbs. Standard - Our standards are simply better. The Horizon APC-45 Programmable Paper Cutter. Programming power - 30 job program memory up to 99 steps each. Fully automatic paper clamp and powered backgauge. Accurate. Compact. Dependable. Productive. Easy to use. Superior performance. Instant recall presets. Simultaneous two-hand operation for safety. Safety beam protection. Stops cutting action instantly when beam is broken. Rear safety cover enclosure. Removable security key for access control. Illuminated cutting line. Total cut counter and resettable blade life indicator. Precision cutting in .005" increments. Independent foot pedal control of paper clamp. Control panel display - informative LCD, easy to learn, helpful design, adjustable viewing angle. Select basic operation mode. Then, simply input your cut and press 'Enter.' Increase productivity with the 'Divide By' feature. Simply and accurately let the APC-45 calculate your cut for you. Enter a new world of productivity. Select program mode. Enter job memory number. Program LCD shows cut sequence. Start cutting and the program automatically sequences to the next cut at each step. Thirty programs can be stored for instant recall, each with up to 99 steps. Select stored programs, create new ones, complex or simple. It's all easy with the APC-45. Versatility - trimming 12" x 18" down to a full bleed 11" x 17". Simply select program and start cutting; the APC-45 does it all. Start the program and watch your productivity soar. From a minimum cut of 1.57" to trimming 12" x 18" sheets; the APC-45 meets the demand. Precise, square, perfect. Make your work a cut above. 2" stock push out assist in program mode. Program complete. The result - a beautiful 11" x 17" full bleed print. APC-45 Paper Cutter - 17.7" cut width and depth capacity; 2.3" cutting height; minimum cut 1.57"; automatic paper clamp; powered backgauge; 30 job program memory; cut safety beam; removable security key; illuminated cut line; foot pedal clamp control; accurate to .006" high; standard outlet with 115 volt power; quality construction; impressive engineering and design. www.sdmc.com. 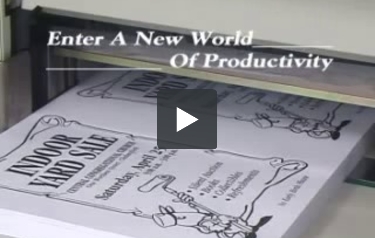 Do you need an electric paper cutter with a terrific cutting capacity? If so, you should check out the Standard APC 45, a device that can slice through hundreds of sheets at time. Here's everything you need to know about this machine. The APC 45 can cut stacks of paper that are up to 2.3 inches tall. Thus, you'll be able to cut over 500 sheets at once, which is more than an entire ream of paper. Since this device has a 17.7-inch cutting width and 12 inches of space in front of the blade, you'll be able to trim both small and large sheets of paper. This machine's cut cycles last for 8 seconds so you'll be able to process a lot of paper in very little time. There's a digital cycle count readout so you'll know how often you've used the machine. The cycle cut can be reset if you want. The APC 45 also has an LCD readout and a digital control panel so you can have total control over the entire process. If you want to program certain processes into this device, you'll be happy to know you can store up to 30 programs. This feature will help you save time because you won't be constantly telling the machine what to do. The APC 45 is pretty easy to use thanks to its automatic paper clamp, illuminated cutting line, and powered backgauge. There are also push-buttons you use to start the cutting process. They must be pressed simultaneously for the machine to do its work. Like some of the other electric cutters on the market, the APC 45 is equipped with a keylock. The keylock helps prevent unauthorized use. For your convenience, two security keys are included with this device. This cutter has a safety beam detector stretched across the throat opening. If your hands ever cross over the beam, the machine will cease cutting so you won't get injured. The APC 45 is a well-constructed machine and it's durable enough to withstand daily use. The blade is made out of hardened steel so you'll get a crisp edge whenever you cut with it. This cutter comes with all the accessories you need to get started with it. The accessories include a soft clamp, tool box, knife holder, and an extra blade. The APC 45 is a floor model and not a desktop device. It approximately measures 30" x 35" x 60" and will take up a fair amount of room. This is a great machine for binderies, print shops, and so on, but it might be too large for some offices. And finally, this trimmer is backed by a one-year warranty. Overall, the Standard APC 45 is an excellent paper cutter and one that would be great for a variety of different work environments. This device's cutting capacity is definitely impressive and you'll find that the other features make this trimmer very user-friendly. If you're in the market for an electric paper cutter, make sure you check out the APC 45. It may be just the trimmer you've been looking for. Our cutter is not cutting the right size. When we enter 8.500 to cut paper to 8.5" it cuts about 0.08 off. What do we do to fix this so it cuts the right size again? Thank you for your question. I am sorry to hear you are having issues with your Standard APC 45. To address technical issues the best first step is to contact the manufacturers technical support department. The manufacturer is Standard and their phone number is (800) 526-4774 . If they are not able to assist, we are based out of Oregon, our service area is OR,WA, IL and southern CA. If you are in one of those areas contact us and we can set up a service call at (800)944-4573.. If you are not in our service area we would refer you to a 3rd party nation wide service provider Serv Right, their phone # is 1-800-642-6015. Please let us know if you have any other questions or concerns.